Fancy some tropical mountain climbing or an encounter with a friendly manta-ray? Adventures are awesome in The Islands of Tahiti! While luxurious relaxation has always been a compelling reason to visit The Islands of Tahiti, new adventure activities are popping up every year. Zip-lining, lava-tubing, shark diving and swimming with whales are just a few of your options for tropical thrills. Or join the pro surfers on the reef break at Teahupo'o, dubbed the heaviest wave in the world. Keen on hitting the surf? There are numerous places for surfing, in fact Tahiti has been described as a 'tropical wave factory'. Whatever you like doing on, under or above the water, The Islands of Tahiti are ready to deliver. There are serene lagoons, surf breaks and beautiful beaches, as well as magnificent stretches of open ocean between the islands. 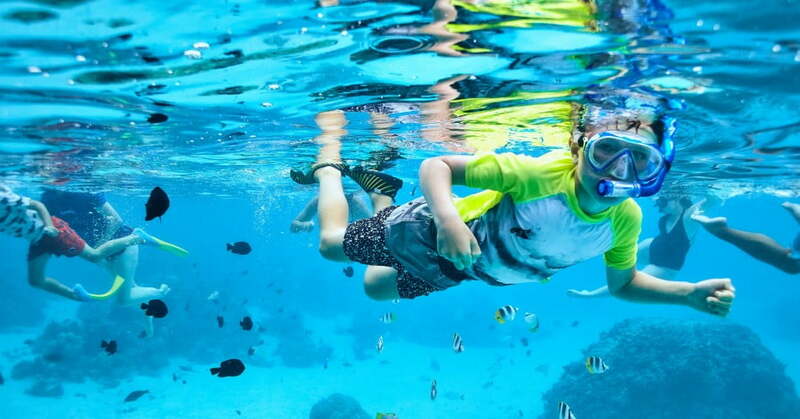 Snorkelling is the easiest way to explore lagoon environments, which are protected by outer reefs. Nearly every resort has a recommended snorkelling spot, or you can choose where you stay based on the quality of their coral gardens. The lagoons of Moorea, Bora Bora, Taha'a, Huahine and Tikehau are all known for exceptional snorkelling. If you're a scuba diver, or want to become one, the ocean drop-offs and passes of Tahiti are legendary. As well as colourful reef fish and graceful manta rays, you can look forward to schools of barracuda and an immense range of reef sharks. Shark diving is big here, including shark feeding dives. The Islands of Tahiti welcome humpback whales from August to October every year and dolphins cavort in the local waters all-year-round. If you'd love a cetacean encounter, either from the deck of the boat (whale watching) or actually in the water (swimming with humpback whales), ask your hotel to recommend a local operator. Keen on hitting the surf? There are numerous places for surfing, in fact Tahiti has been described as a 'tropical wave factory'. The most famous (and most challenging) location is Teahupo'o – pro surfer Kelly Slater loves this huge break so much, he bought a house nearby. If you're interested in a surf trip to Tahiti, there are breaks for every level of experience - Papara and Papenoo can be perfect for learners. From Papeete you can journey inland on a 4x4 tour to explore the rainforested mountains, valleys, waterfalls and archaeological sites of Tahiti's main island. Make a day of it and you'll have time to discover the 19th-century French fortress of Mount Marau, views of the island's tallest peaks and the beautiful Cascades of Faarumai, which are picture-perfect against a backdrop of lava rock and rainforest. Top it all off with a swim in the exquisite pool at Haamaremare Rahi. Another land-based adventure on Tahiti's main island involves delving into the Hitiaa Lava Tubes. Led by an expert guide, you'll venture underground to explore dark, mossy caverns formed during Tahiti's volcanic past. It's a watery trip, because streams flow through the tubes at some points. The subterranean waterfalls are magical. The Fautaua Valley trail lets you explore Tahiti's beautifully wild interior without the need for a local guide, however you will required an access permit from Papeete Town Hall. This hike begins on the flat, then climbs up to the spectacular Fautaua Waterfall, where there's a superb swimming pool. If you're super-fit and looking for a challenge, consider the hike up Mount Aorai (1400 metres). We recommend you take a guide, because this adventure almost falls into the mountaineering category. On the island of Moorea, zip-lining At Tiki Parc is the latest way to appreciate the lush mountainous terrain. As well as zip lines, the courses involve walking nets, bridges, swings and rope ladders.